Monica Maschak - mmaschak@shawmedia.com Wade Coll (left) and Kristopher Coll (right) do a mute grab as Cooper Slack (center) does a tindy grab simulatneously off a jump at the Raging Buffalo Snowboard and Ski Park in Algonquin on Wednesday, January 2, 2013. The park offers equipment rentals as well as group and private snowboarding lessons. Monica Maschak - mmaschak@shawmedia.com Derek Larsen, 20, prepares to land from a frontside rodeo flip off of a jump at the Raging Buffalo Snowboard and Ski Park in Algonquin on Wednesday, January 2, 2013. 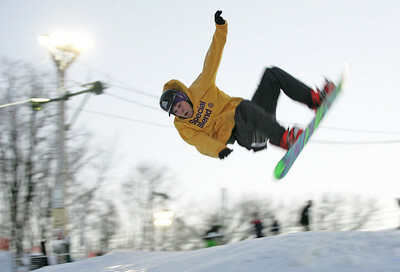 The park offers equipment rentals as well as group and private snowboarding lessons. Monica Maschak - mmaschak@shawmedia.com A snowboarder launches into the air from a jump at the Raging Buffalo Snowboard and Ski Park in Algonquin on Wednesday, January 2, 2013. 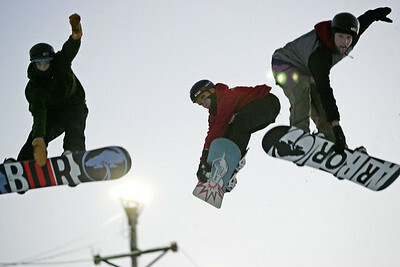 Wade Coll (left) and Kristopher Coll (right) do a mute grab as Cooper Slack (center) does a tindy grab simulatneously off a jump at the Raging Buffalo Snowboard and Ski Park in Algonquin on Wednesday, January 2, 2013. 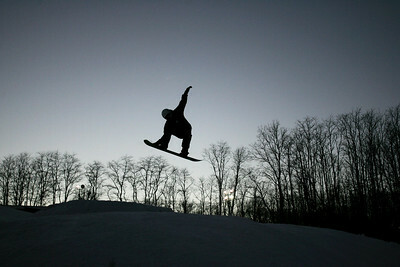 The park offers equipment rentals as well as group and private snowboarding lessons.